The list of accepted posters presentations is available on the Poster Sessions webpage. There are two sessions for poster presentations, each two hours long: 12:00 to 14:00 on Monday 21 August 2017 and Tuesday 22 August 2017. During these times there will be many delegates walking around the Hall and you are therefore required to be present to discuss your poster with any delegates that are interested to know more. The board numbers, corresponding to numbered boards at the congress venue, are allocated and published on the website and also in the printed programme. Please respect the board number you are given which correspond to the list in the programme as well. The boards are located in the “Poster Area” of the Exhibition Hall (see Floor plan). Material has to be posted to the boards on Sunday 20 August 2017 between 12:30 and 16:00 before the Exhibits Opening Party, which takes place in the Exhibition Hall (see Floor plan). If you choose to register with day registrations, you do not need to register for the set-up day (Sunday 20 August). The posters should remain on display until Wednesday 23 August 2017 and ideally should be removed between 14:00 and 15:00 on that day, at the latest. There is no storage space and therefore any handouts, leaflets or other material that is not fixed to the board should be brought with you on the Poster Session days. The available poster boards are 950mm wide and 225mm high portrait style. 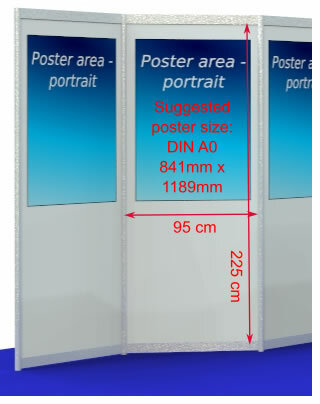 For printed posters, the standard poster size of DIN A0 841mm wide x 1189mm high is the minimum size. It is recommended that a printed poster be no larger than 900mm wide and 1900mm high. If you are using photographs, graphics and pieces of text, these should also fit within the area of 900mm wide and 1900mm high. Posters have to be fixed onto the boards by means of double-faced adhesive tape, which will be provided on site. IFLA is interested in obtaining digital copies of presented posters in the born digital format – JPG, PNG or PDF – and publishing them with their abstract in the IFLA Library after the Conference. All presenters submitting a digital poster are required to complete the online Authors’ permission form with the accurate details of their posters. In addition to the digital poster, presenters are asked to include an abstract (in MS word) of no more than 300 words. Deadline for submitting the poster with an abstract for publication: 31 October 2017. Posters are a combination of content and appearance. The content must be interesting, professional, and appealing to a broad audience. The appearance of the posters should be attractive, with a combination of graphics, photographs, and text. The presenters of posters often make available to delegates handouts: leaflets containing more information, printed pamphlets, or other types of material for distribution, which might explain or promote the contents of the poster. It is important to bring reasonable quantities of these handouts, and note that free copying facilities are not provided by the congress. Poster sessions will be monitored by the Professional Committee’s jury to check on the efficiency and utility of the model for presenting information to the library community during the Congress. They will also select a winner of the “Best IFLA Poster 2017” which will be awarded during the Closing Session on Thursday 24 August 2017.